There are many splinting accessories that help with the creation of a thermoplastic splint. With the right splinting accessories, molding and conforming the splinting material around the patients injured area can become a lot easier. Splinting accessories include items that can help cut, heat or cool the splinting material. For cutting splinting material, ordinary scissors will not do the job. Only heavy-duty scissors with smooth edges can accurately cut splinting material. The sharper the edge, the easier and more precise it will be to cut the splinting material. Heating and cooling tools are also necessary when dealing with thermoplastic materials. The CanDo® Heat Gun is used to manipulate the splinting material so that it can be effectively molded to the patient. The temperature control of the CanDo® Heat Gun allows for temperature adjustment from 250 to 1,100 degrees Fahrenheit. Making it hot enough to adjust the splinting material, even after the splint has hardened. 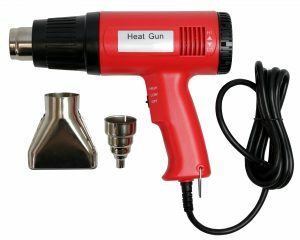 The heat gun also comes with a kit of air concentrators. Air concentrators can be used to make the hot air coming out of the heat gun more concentrated or more widespread. The 7/8” and 3/8” air concentrators pin point the hot air to specific areas of the material. The 3-inch air spreader is great for manipulating wider areas of the material. To speed up the cool time of thermoplastic material, we recommend Quick Freeze. Quick freeze is a cold spray that is used to cool thermoplastic material to its final molded form. Pair this with the CanDo® Heat Gun and you can adjust thermoplastics with ease. Splinting accessories are necessary to easily mold thermoplastic materials. To view our selection of splinting accessories, click here.